After getting the first challenge (portraying an alpine cornice at dawn in front of the solar disk from the Canigó), our eyes turned to the Ecrins, alpine mountains which the sun never appears behind and therefore, required very good atmospheric transparency for to reach it. The weather models gave us clues to think that between February 20st and 21nd, that the visibility could be highly favorable, although of course no guarantee. For me, it was much easier logistically because since the Pyrenees was 150 kms from where I was. For the companions was much more far and more difficult for circumstances. The early morning before the 20st. I went to the mountains of Vallter (Girona) to do a first check of the sky. 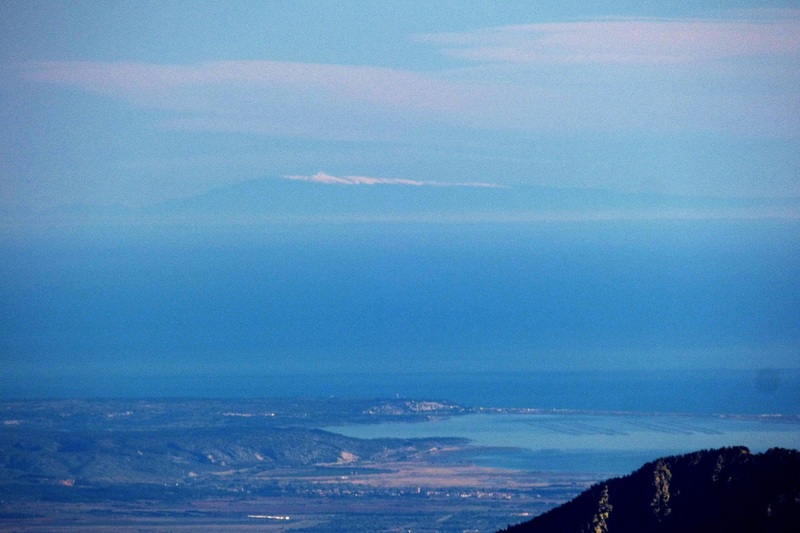 From above, at dawn I managed to see the silhouette of the Ventoux and later, from Bastiments peak, the glitter of the snow of its summit, which at first seemed to me a long cloud as I didn’t quite believe that Ventoux was the whole thing.. The sky was fantastic and could still be more next day. Both, me I and Juanjo thought this from certain days. .. But that was enough to see the Alps, this was already very uncertain thing. To the next day, repetition of the attempt. 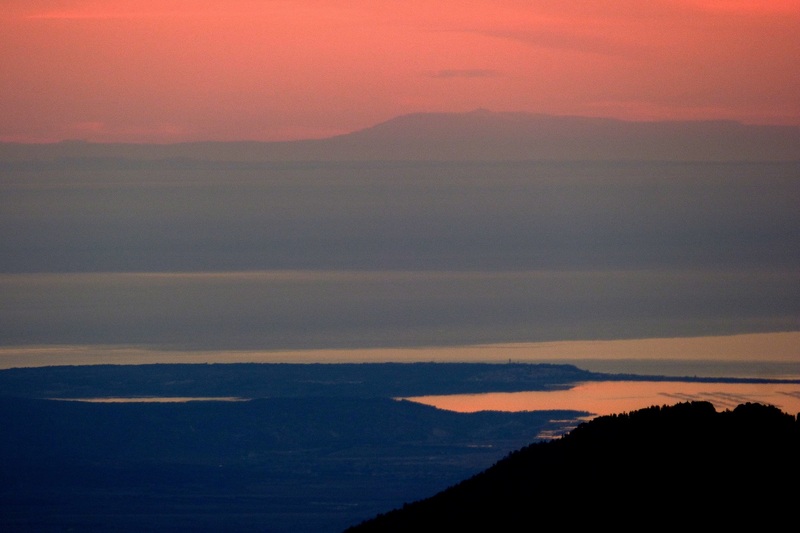 …From the Pic de la Dona, at about 2700 meters in height, appeared the silhouette of the Ventoux again before dawn ..And to its left, cut shapes! ..But highly distorted by the atmospheric refraction, so much that they were unrecognizable aspect and well resembled clouds. The before day the spectacle was a little similar but with more clouds. 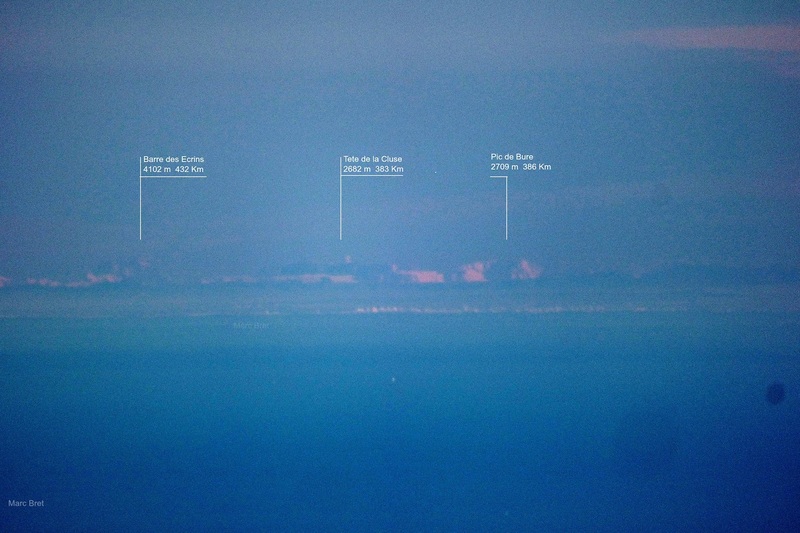 …When the sun was rising up more, the silhouette of the Ventoux disappeared, and (of course) also everything else .. It seemed that the function had already finished and I was ready to go down ..But I changed this option and decided to go up to the Bastiments (near next to the previous one But even higher). After a while I was at the top of the Bastiments, by certain a summit very frequented by mountaineers, especially from Catalonia. From that higher height and with the sun more and more distant in the angle, the Ventoux was beginning to become visible again, an unmistakable sign that the transparency was most striking. Besides -important- not only the snow (as on the previous day) was perceptible but that day also the rest of the silhouette! .. To its left, nonetheless. Nothing divisible by the naked eye. Nothing .. So. End of function?. Not. It was no time to give up. Then I took a polarizing filter. It was 11 o’clock in the morning and the sun was almost 90 degrees from its ideal position. I put the glass in front of the eyes… I turned… and suddenly: Yes!. Little white dots, like dwarf stars, but perfectly arranged in line, as if they were the satellites of Jupiter contemplated for the first time by Galilei!. There they were!, points tiny in size… but that were summits much more enormous than those of the Pyrenees of which I was at that moment. The sky, which the day before had allowed to see the snow in full day above the Mont Ventoux, the next day showed the snows of the remots Alps. If there is no snow in the mountains, in broad daylight, both with filter and without filters, it is probably impossible to reach the natural mountains more than 350 kms. 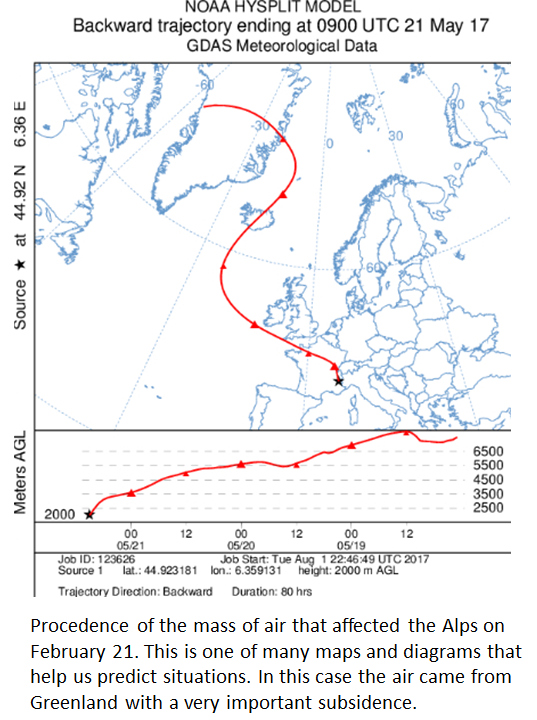 The atmospheric extinction factor is very intense, even in the skies very cleans … But even so, is the theory .. We will continue climbing mountains and trying to surpass the supposed borders of theoretical scope ..
That yes, we will have to try not to dirty the atmosphere any more in the future. Otherwise it will be more impossible. The silhouette of Ventoux (or Ventor in occitante language) at the begin of the moorning. The snow, brillant in the distance during the day, especially with polarized filter. Although I could see this panorama withouth filter, I puted this polarized picture because is a little more easy to perceibe the contrast of the lines. Polarizer filters are a little visual “traps” that in certain circumstances allow to see better the far silhouettes (although in the majority of the occasions are counterproductive). Much more effective are the selective infrared filters, however in that case the resulting images, although have a wide range of shades between light and dark, at the same time lose color variety. Finally and writing a little more of the Ventoux than the Alps, I include another photograph, but in this most recent case, on May 21 of this year (2017) and from another summit of Pyriness but something more distant, to 352 Kms. In this case the autor of this picture is Juanjo Diaz de Argandoña. We went together by the night and joined in the summit whith Jordi Solé also (other member of the BH) who walked from the norht face after having slept on the slope. In my case, I have frequented the mountains of the Eastern Pyrenees and I have perceived the Alps and especially Mont Ventoux. < Previous Westport, WA – Mt. Rainier | 178 km. 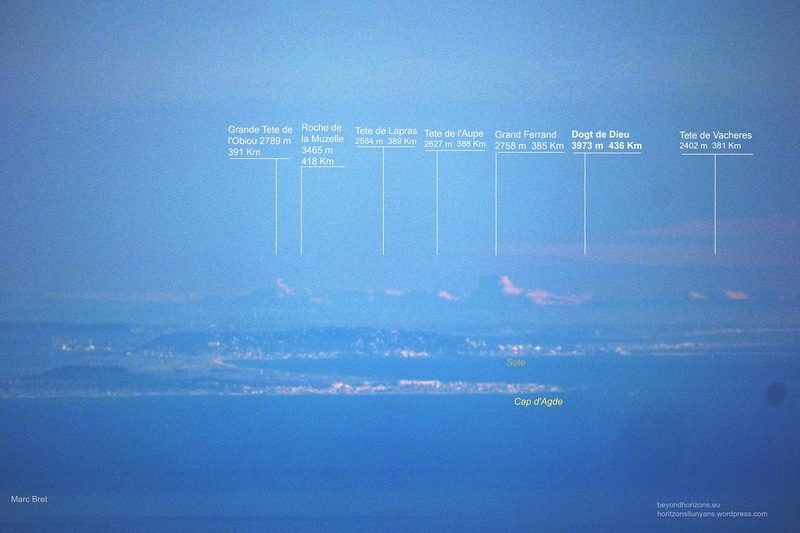 Next > Plomb de Cantal – Mont Blanc | 332 km.